Keeping healthy habits over time isn’t easy—but it is worth it. Once you push past the first few weeks of starting a new fitness program, you probably start to notice some changes in how you feel. You might feel challenged to stay motivated—changing up your workouts is a necessary component of a healthy lifestyle. Resting heart rate increases—exercise can help decrease resting heart rate. The speed at which intestines empty decreases—exercise can help increase speed. Metabolic rate decreases—exercise can help increase metabolism. Body fat increases—exercise can help decrease body fat. The risk of depression increases—exercise can help decrease this risk. 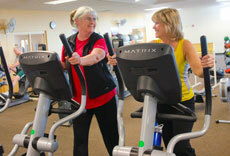 To realize the benefits of exercise, it’s critical that you participate in physical activity regularly. For example, running five miles on one day and then skipping workouts for the next two weeks doesn’t work that well. Exercising sporadically can decrease motivation, decrease endurance and increase injury. However, “consistent workouts” does not mean that you must work out every day—it’s important to build rest days into your fitness program. Does it really matter if you work out three days in a row, rather than spread activity across the week? Yes. The Physical Activity Guidelines for Americans are based on years of scientific research, which shows that the longer, harder and more often you exercise—the greater the health benefits. Scientific American examines common claims about the benefits of exercise and says that family history and other factors can also play a role in how fitness can have an impact on your overall health.